For UK Parliament Week, we're explaining the role of MPs in Parliament, how we engage with them to make real change happen and how you can get your MP involved. To help you, we’ve picked out three key ways your MP can support you in making your voice heard in Parliament. Members of Parliament (MPs) are elected to represent the interests of constituents like you and having their support can really help make a difference. They can be useful in putting an issue on the political agenda nationally, raising it with local decision makers or getting publicity for campaigns. This year, over 100 cross-party MPs have supported our campaigns, and 50 have joined us publically as Bowel Cancer Champions - pledging to support our campaigning work locally and nationally. Read on to find out more about what you can ask your MP to do to help you campaign on issues you care about, as well as some examples of how they’ve supported our campaigns in Parliament and locally. The Department of Health and Social Care (DHSC) is responsible for managing heath budgets, developing national health policy and setting priorities for delivering health to the population. There are multiple ways your MP can raise an issue with the DHSC. One way is by submitting a Parliamentary Question to the Health Secretary based on a concern you’ve raised. This can be done face to face during health questions in Parliament or in writing. They can also write a letter directly to the relevant Minister or arrange to meet with them to discuss the issue you have raised. In September this year, MPs helped raise our Capacity Crisis campaign with the Health Secretary. Forty-five cross-party MPs signed our open letter calling for a fully funded action plan to tackle NHS staff shortages in bowel cancer services to help influence the NHS long term plan being developed. MPs can apply to debate an issue in Parliament. This gives cross party MPs an opportunity to raise local or national issues and receive a response from a Government Minister directly. 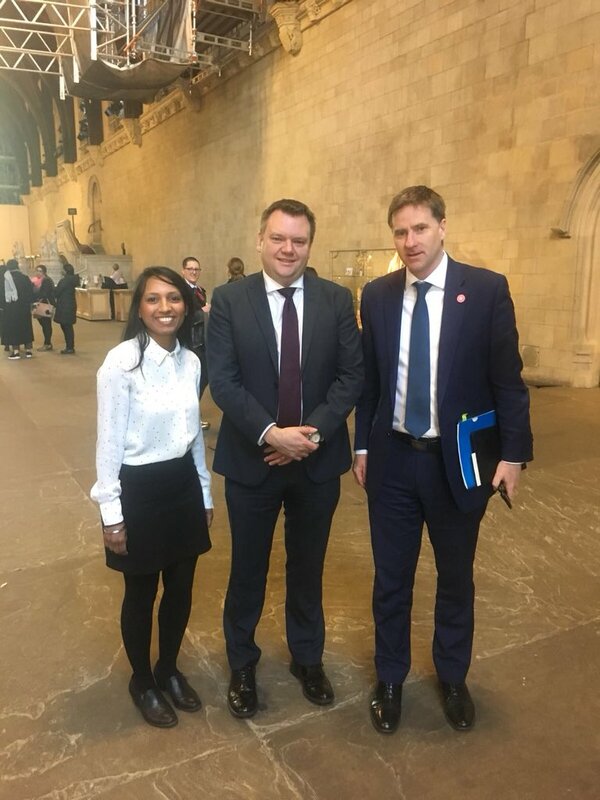 Nick Thomas-Symonds, MP for Torfaen and one of our Bowel Cancer Champions, secured a debate in Westminster Hall to raise concerns about delays to improvements to bowel cancer screening. In response to the debate, the Minister for Cancer, Steve Brine MP, publicly committed to rolling out the new faecal immunochemical test (FIT) into the Bowel Cancer Screening Programme this Winter in England. This is something we’ve been campaigning for for some time now. You can find out more about FIT here. Not all decisions on health policy are made by the Government. Local health bodies are responsible for how local services are run and what is provided in NHS hospitals. They have a duty to involve their patients, carers, and the public in decisions about the services they fund. Your MP should have a relationship with their local health body and can also raise your concerns with them to really make your message heard. As part of our Time to Test campaign, we asked campaigners in England to write to their MPs to raise their concerns that their hospital wasn’t testing all bowel cancer patients for Lynch syndrome, in line with clinical guidelines. This got Lynch syndrome on the agenda of local health bodies, with some hospitals now considering how testing can be introduced locally. You can get in touch with your MP by writing to them, emailing them or calling them. When writing to them, make sure you keep your message short and simple and include something actionable, such as asking them to sign a letter, write to your local health body or ask a Parliamentary question. To find out more about your local MP and their contact details, you can use ‘They work for you’. Become a campaigner and join thousands of people helping us save lives and improve the quality of life of everyone affected by bowel cancer. Find out if your MP is a Bowel Cancer Champion in Parliament using our handy tool. Read Nick Thomas Symonds MP's blog explaining why bowel cancer screening is vital.